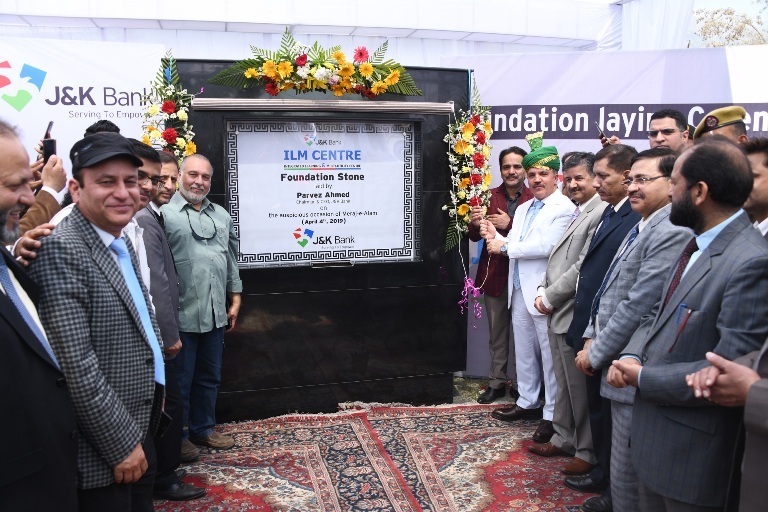 Parvez Ahmed lays foundation stone of Bank’s Knowledge Centre ILM (Integrated Learning and Multi-Utility Centre) at Srinagar. Parvez Ahmed, Chairman and CEO, J&K Bank today laid the foundation stone of JK Bank’s Knowledge Centre ILM (Integrated Learning and Multi-Utility Centre) at Srinagar in presence of Executive Presidents P K Tickoo, R K Chhibber, Presidents, Zonal Heads, Cluster Heads and other senior officers of the Bank besides a number of prominent citizens in a simple but impressive function. Planned on the lines of Green Building Concept, the proposed sprawling and completely eco-friendly complex of the Bank will house the Bank’s Staff Training College, first-of-its-kind Staff Housing Facility in the valley, Executive Guest House along with Health & Wellness Center, Mosque besides a 24x7 IT Operations Division, Mega Currency Chest and Examination Hall, a state-of-the-art auditorium and Centralized Records Venue. The center will have a 3-level parking basement accommodating about 1000 cars. After laying the foundation stone, Chairman J&K Bank unveiled the three dimensional model of the Bank’s ILM Center in presence of Architectural Consultants Ratan J Batliboi, Tasaduq Kher and Zainab Sarawala, who gave a detailed overview of the upcoming project to the rapt audience. Commenting on the upcoming infrastructure the Chairman J&K Bank said, “The iconic building on the banks of Jhelum will be a true manifestation of the spirit of Kashmiryat and resonates with the history of Kashmir as centre of learning. It will showcase the creativity, inclusivity and composite culture with compassion for the environment which are the hallmarks of the people of the state in general and staff of the Bank in particular. The building will be a reflection of Kashmiri conscience which has always upheld coexistence of multiple faiths in a harmonious environment since time immemorial”. Addressing the staff Parvez Ahmed said, “All of us are aware that with numerous changes in the banking sector the focus of HR now is on other objectives such as developing the next generation skill sets, develop transformative leaders and drive all talent related decision making based on data and analytics. Over the years after implementation of the People System in the Bank we have achieved a fair degree of administrative efficiency in processes involving Human Resource. We are now aiming to develop performance management systems that can help us better gauge the performance continuously, link organization goals to individual goals and enhance the productivity of our existing work force. Various banking processes have either been eliminated or completely restructured due to the fast changed banking and FINTECH interventions, therefore requiring our operational employees to focus on other processes such as enhancing the customer experience with us or collaborating as a team towards business development. The new ways of service delivery has posed a considerable challenge to us to keep our work force ready and equipped to perform through effective learning platforms”. “We have a big responsibility being the Bank of first choice for our people along with having a systemic importance for the economy of the state and I am glad that team JK Bank has time and again demonstrated an exceptional character by earning the trust and making the fastest turnaround with seven consecutive quarters of profitability up to Dec 2018. I still remember there was a lot of pessimism when we plunged into the loss in 2017 due to burgeoning NPAs catalyzed by overall degradation of banking environment coupled with legacy of NPAs in our balance sheet but J&K Bank arose like a Phoenix due to the indomitable spirit of all of us “asserted Parvez Ahmed. Expressing deep appreciation for the dedicated staff of the Bank he said,” I think our staff deserves the credit for making extraordinary efforts by working day and night to execute the Bank’s turnaround strategy and making one of the fastest turnaround in the banking industry with seven quarters of continuous and sustained profitability. As I have already declared in a categorical manner that the worst is now behind us and Bank is poised for strong growth and profitability going forward. We have just closed a hectic financial year in a challenging environment with a good set of numbers due to your efforts. The way our growth and numbers are behaving I am sure that we are well on course to achieve our targeted profit of Rs 2000 Cr in FY 2022. Earlier, Executive President R K Chhibber in his welcome address extolled the Chairman for his vision and commitment towards the welfare of the staff, “Today is a momentous day for the Bank and it coincides with Meraj ul Alam and the name has been conceptualized by the bank under the guidance of the chairman. The building has been named ILM center which means the center of knowledge and will be certainly become a landmark in the Srinagar city”, he added. Executive President P K Tickoo also spoke on the occasion saying, “It is a thought. It is a process and not a mere building. It will set in motion many great things in the future. It is going to be the start of a new era and we will behold the dawn of success as an institution”. On the occasion, cash prizes and mementos were given to Naatkhwaans, students from Payam Educational Academy and Vitasta Music Institute along with the instructor Ajaz Sahir. The function concluded with vote of thanks by Vice President Sushil Kumar Gupta, who extended gratitude to the Chairman, entire management present on the occasion and thanked all the departments, children, vendors, security guards and all those who made the event a success.